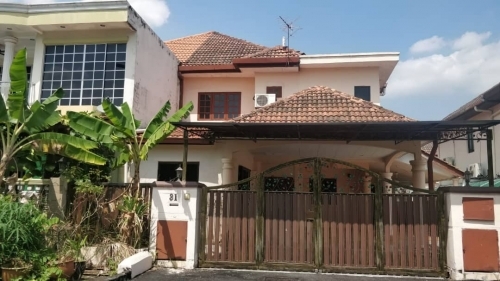 Rumah 2.5 sty Semi D, Puncak Bangi, Bandar Baru Bangi for SALE ************************************************************** Property Details: - Semi D unit - 2 1/2 Storey - Build up: 3,484 sqft, - Land Area: 55'x 80' sqft. - 5+1 Rooms & 6 Bathrooms - Renovated unit - All rooms & family hall complete with airconditioner - Wardrobe for each room - Kitchen cabinet - Wet kitchen - Facing East Puncak Bangi, are of contemporary design incorporating quality finishes and innovative design that enhance your lifestyle and elevate living standards. This truly a home that encapsulates the essence of its surrounding environment for an unparallel living experience. Advantages: a) Lakeside Luxury amidst lush greenery b) Next to Tasik Cempaka, Golf Club, Kompleks PKNS, Hulu Langat Land Office, Bangi Walk, shop lot. c) Located at bangi commercial centre. 5 minutes to PLUS highway, 10 minutes to Kajang, 20 minutes to Cheras, 5 minutes to UKM, 20 minutes to UPM, Uniten, Kolej Ikram and many more d) Gated & guarded 24 hrs with CCTV. Very nice neigborhood e) Low density Asking RM 1,700,000 (nego for serius buyer only) DEPOSIT : 10% (2,12% BOOKING, 7.88% SPA) Loan & Lawyer can be arranged. Call / Whatsapp / Telegram : 019-286 0852 Halimatun [REN 16882] 019-282 0852 faizal [REN 17767] Rescom Realty VE(3)0244 ------------------------------ || Selling Your Property? || ------------------------------ House | Condo | Land | Shop | Factory @ Klang Valley or Selangor. ------------------------------ We will do our best to assist you ! Please fill up below form and we will contact you soon. Looking to buy or let a property? Try our listing search. Thinking to sell or rent your property?